Origin and Habitat: Kenya, Tanzania, Uganda, Sudan, Ethiopia, Eritrea, Djibouti, Somalia, Yemen, Arabia, Oman. Type locality: Sudan, between Atbara and the Red Sea. Altitude range: 0–1900 metres above sea level. Habitat and ecology: Sansevieria ehrenbergii occurs in rocky ground, usually in the shade of thickets or small trees. Often on low limestone hills of the coastal mountains. 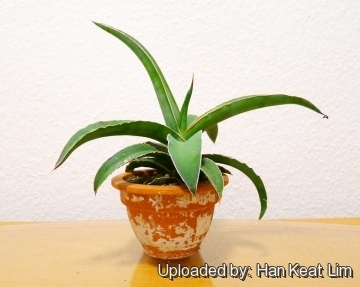 Description: Sansevieria ehrenbergii is a fruticose, perennial, succulent with or without stem, sometimes forming dense stands. The leaves arise from a prostrate rhizome, and are up to 3 metres long, 2-ranked, 4-7 in number, rigid and succulent when mature, deeply channelled on the upper surface, margins red, apex spine-tipped. The flowers are grey-green tinged with red and are produced on a leaf-less axis up to 2 metres long. The fruit is a green to orange globose berry. Rootstock (rhizomes): Woody, wide-creeping, rounded, subterranean, 2.2–2.6(–3.6) cm thick. Stem: 15-90 cm long (usually less than 25 cm high), concealed by leaf bases, erect, terete, with 1.5–3.6 cm long internodes, 2.8–3.1 cm wide, tough fibrous, yellowish grey on outer surface. Leaves: 5–9(–13) crowded in a distichous rosette, erect or more or less spreading. Stipules absent.Petiole absent. Central leaves subterete, laterally compressed, with flattened sides, rounded on the back, very rigid, reaching a length of (30-)75-300(-330) cm, 2.5–3.5 cm thick from side to side, 3–4.5 cm thick from front to back, with an acute groove down the face, many slight grooves down the rounded back, smooth to rough surface, glaucous especially in juvenile and young leaves, erect or less spreading and spreading acute edges, with a narrow line of red-brown and white, tapering upwards; rather abruptly ending in a spine 0.8–1 cm long, stout, horny, hardly piercing. Basal leaves, rudimentary outer ones small, ovate, all round with a triangular channel as broad as the leaf all down the face and 5–12 shallow grooves, very faint or impressed lines down the sides and back; dark green to bluish green, the longitudinal lines blackish-green, no transverse bands; channel margins 1–2 mm wide, acute, reddish brown with small white membranous edges, usually spreading to a slightly wider breadth than the rest of the basal part. Inflorescences: Stalk wavy, ascending (90-)150-200(-300) cm long, 0.6–1.1 cm thick with a deltoid panicle with many ascending branches in the upper three-quarters of its length, the lower branched, the upper simple. Flowers 4–5(–7) per cluster, clusters numerous, arranged in a spiral. Pedicels 2.5-4 mm long, articulated above the middle. Bracts minute, deltoid, membranous 1–2 mm long. Flowers: Bisexual, regular, 3-merous, greyish-white or grey-green, tinged with purple. Perianth tubular,11-13 mm long. Tube 5–6 mm long. Lobes 6, white to purple longer than the tube, free parts (3-)5-7(-9) cm long, linear, obtuse. Stamens 6, as long as the perianth-lobes, exserted, filament about 1 mm long, anthers 0.2 cm long, yellowish. Ovary superior, 3-celled, style filiform, 14 mm long, thin finally exserted, stigma capitate. Fruits (berries): 10 mm in diameter green turning yellowish green or orange when ripe, 1-3(-4)-seeded. Blooming season: Sping. The flowers open at night. Similar species: Sansevieria ehrenbergii is similar to Sansevieria robusta, but has clusters more prominent and closer together with leaves more upright. Sansevieria ehrenbergii is also very similar to Sansevieria powellii that has a more or less tall stem, while S. ehrenbergii is more or less stemless. Sansevieria ehrenbergii Schweinf. ex Baker: has leaves are up to 3 metres long, 2-ranked, 4-7 in number, deeply channelled above, margins red. Distribution: Kenya, Tanzania, Uganda, Sudan, Ethiopia, Eritrea, Djibouti, Somalia, Yemen, Arabia, Oman. Sansevieria ehrenbergii cv. Banana: is a compact form Somalia called banana because of its very fat, boat shaped leaves that are curved like a banana, hence the name. Notes: The genus Sansevieria numbers about 60 species most of them native of Africa, it has been variously included in the Amaryllidaceae, the Liliaceae and the Agavaceae but is nowadays usually placed in the Dracaenaceae. 9) Wikipedia contributors. "Sansevieria ehrenbergii." Wikipedia, The Free Encyclopedia. Wikipedia, The Free Encyclopedia, 17 Jan. 2015. Web. 3 Jan. 2016. 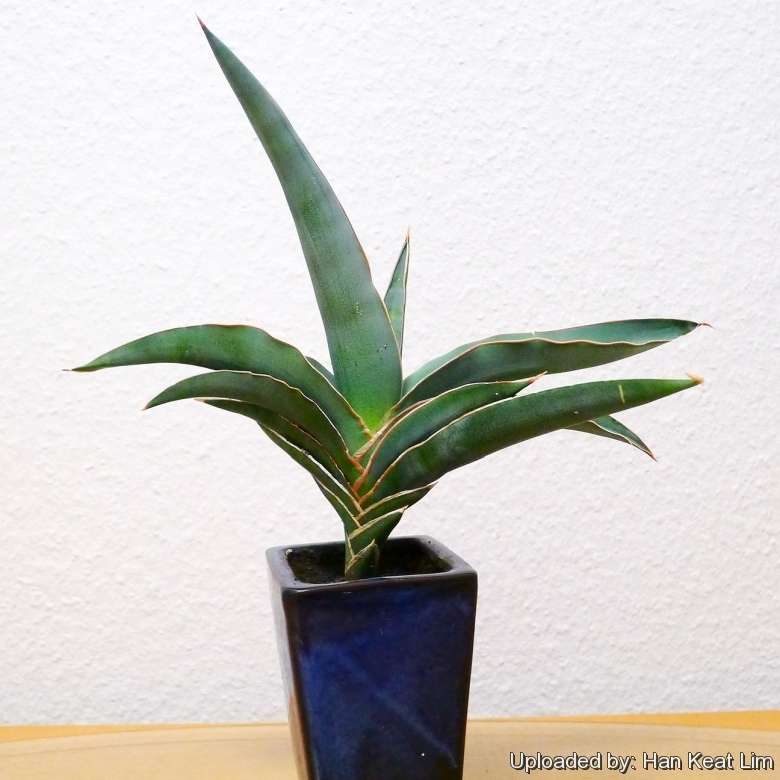 Cultivation and Propagation: Sansevieria ehrenbergii are easy to grow and tolerate a wide range of conditions. Use a soil mix consisting of 3 parts loam to 1 part of pumice. The plants are very drought tolerant and are watered about every other week during the growing season. They are fertilized once during the growing season with a balanced fertilizer. During the winter months they are watered once a month. Outdoors: In the garden In mild to tropical climates it prefers semishade or shade and it is not fussy. Propagation: Sansevieria ehrenbergii are propagated by cuttings or by divisions taken at any time. Cuttings should be at least 10 cm long and inserted in moist sand. A rhizome will emerge at the cut edge of the leaf. Traditional uses: Sansevieria ehrenbergii leaves were used for fibre and for making ropes. This practice is largely discontinued now as ropes from synthetic products, such as polypropylene and nylon are cheaply available. The juice from the leaves is used for treating skin eruptions and pus-filled skin sores. Treatment Juice is extracted from the leaves and dropped on the sores or skin eruptions. The juice is used for minor wounds. The young leaves and fruits are eaten by goats, the rhizomes by cattle, porcupine and gazelle. The plants exude an edible gum. The fruits are made into beads. In Kenya it is one of several Sansevieria spp. planted for soil conservation, for land reclamation and as a living fence. The fibres are tender, smooth and have a long lifespan.